As National American Indian Heritage Month nears its end, this week we’ll take a look at Illinois’ Native American past and what one can learn about it at the Pekin Public Library’s Local History Room. Recorded history in central Illinois reaches back not even four centuries, to the era of the European exploration and colonization of North America. But archaeology and anthropology enable us to learn about the thousands of years of human habitation in central Illinois prior to written records. Naturally much of our local history involves the stories of the white settlers, and the bulk of the materials and resources in the Local History Room has to do with their story. But our local history collection does not neglect the peoples who arrived here first during forgotten past ages, and so from time to time this column has looked back at the original inhabitants of Tazewell County, especially during the period of the arrival of white settlers and the dispossession of the Native American tribes – recounting, for example, the life of Pottawatomi leader Shabbona who dwelt for a while in Pekin, or the Oct. 1812 raid of Illinois Territorial Gov. Ninian Edwards on Chief Black Partridge’s village which was located on the northeast shore of Peoria Lake in Fon du Lac Township. Those who would like to learn more of the first-comers to Illinois can find a great deal of information in the publications on Illinois state history that may be found on the shelves of the Local History Room. Our collection also includes fascinating resources such as the atlas of “Indian Villages of the Illinois County,” which contains reproductions and descriptions of rare historical maps of North America and the Midwest dating from as early as the time of the French explorers of the Illinois River valley in the 1680s. 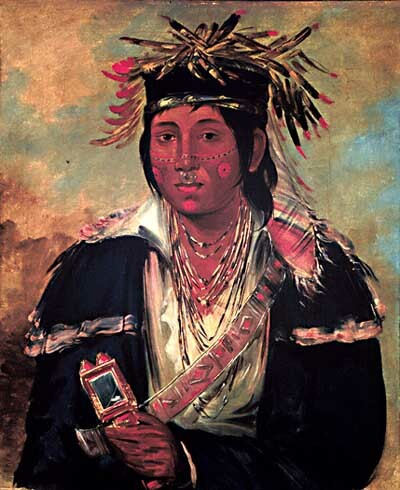 Shown is George Catlin’s 1830 painting of Kee-mo-ra-nia (“No English”), a member of the Peoria tribe, which originally lived in central Illinois but by 1830 had been relocated to Kansas. Catlin’s painting was donated by Mrs. Joseph Harrison Jr. to the Smithsonian American Art Museum. Those whose interest in the first nations of Illinois is more genealogical might want to search Helen Cox Tregillis’ 1983 volume, “The Indians of Illinois: A History and Genealogy,” which includes a lengthy and apparently exhaustive alphabetized list of Native American individuals who appear in the documents of Illinois history from 1642 to 1861, along with the title or description of the historical document where he or she was mentioned. Tregellis compiled this index from 43 different publications. Because Native Americans in earlier periods usually were illiterate and thus did not produce the written texts that are the basis of historical works and genealogical research, we are largely dependent on the texts and treaties of the white colonists for Native American history. Consequently, Tregellis’ index can be a great navigation aid for researchers. One of the more recent additions to the Local History Room collection is Blake A. Watson’s 2012 “Buying America from the Indians: Johnson v. McIntosh and the History of Native Land Rights.” Watson’s book views Native American history through the lens of laws, treaties and the courts, exploring the impact of the 1823 U.S. Supreme Court ruling Johnson v. McIntosh, which, as Watson explains, set important legal precedents that determined the principles that still govern American Indian property rights today. Although it’s a story that encompasses a broad sweep of U.S. history, Watson’s book also touches directly on Illinois and the land that would later become Tazewell County, and in the process Watson tells how land speculators and government agents obtained title to the Illinois country and displaced the native tribes. Stelle’s poem was published as the frontispiece to Tregellis’ book. The bicentennial year of Illinois’ admission as the 21st state in the Union commences on Dec. 3, 2017, inaugurating a year of state and local celebrations that will culminate on Dec. 3, 2018, the 200th anniversary of President James Monroe’s signing of the bill granting Illinois statehood. Celebrations and events commemorating Illinois history are planned for the coming year not only in Springfield, but also in local communities. At the state level, the Illinois Bicentennial Kickoff will take place Dec. 3 at the Abraham Lincoln Presidential Library & Museum in Springfield, and the same day Winter Wonderfest in Springfield will host an Illinois Bicentennial Day. A schedule of events is available online at the official website of the Illinois Bicentennial, www.illinois200.com. In Tazewell County, an official Illinois Bicentennial Committee chaired by Dagit has been meeting monthly since this summer to help coordinate local activities to commemorate the bicentennial. Tazewell County’s celebration of the state’s bicentennial will open next month with a cannon blast in Delavan on Dec. 3, 2017 and the county will also close the bicentennial year in the same way on Dec. 3, 2018. An Illinois Bicentennial Flag Raising Ceremony will take place at 11:45 a.m. Monday, Dec. 4, 2017, on the Tazewell County Courthouse lawn, including a brief program and the raising of the bicentennial flag at noon. Various activities to mark the bicentennial of Illinois statehood are in the planning stages in various Tazewell County communities. Among the events will be a Bicentennial Tea sponsored by the Tazewell County Museum and Pekin Woman’s Club, set for May 12, 2018, at the Mineral Springs Park Pavilion in Pekin. Also, the Pekin Public Library is commemorating the bicentennial all year long with an Illinois Bicentennial Movie Series that will run January to December 2018. On the first Friday of each month at 11 a.m., the library will show a historical video dealing with an aspect of the history of Illinois, Tazewell County, or Pekin. The movies will be shown in the Community Room on the second floor of the library, and admission is free. The movie series commences on Friday, Jan. 5, 2018, with the showing of a 1 hour 40 minute documentary, “History of Pekin,” that was produced many years ago by the Video Pekin Project. The movie tells of the history of Pekin high school, the old Pekin Theatre, Pekin Hospital, and the Old Post Office. This weekly column, “From the History Room,” also will highlight the people and events of early Illinois and Tazewell County starting next month and continuing through the end of Nov. 2018. One of the landmarks of arts and entertainment during Pekin’s bygone days was a military-style orchestra called “Gehrig’s 7th Regimental Band.” Gehrig’s Band is important in Pekin’s history because it was the first community band ever to be formed in Pekin, having a history that begins around the time the Civil War ended. The band’s founder, Edward Gehrig, was himself a veteran of the Civil War. 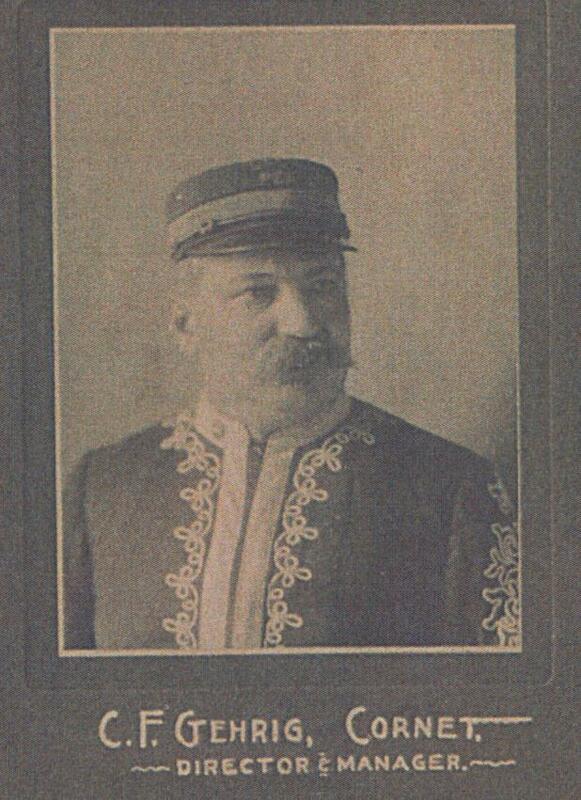 This 1902 portrait of band director Charles F. Gehrig was reproducted in the Nov. 2017 Tazewell County Genealogical & Historical Society Monthly. 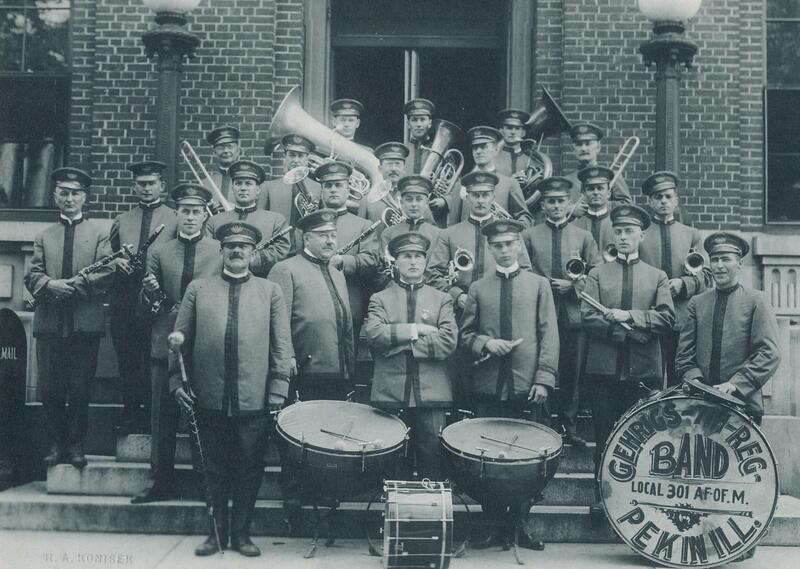 The Sesquicentennial goes on to explain that during the 1920s Gehrig’s Band and Bauer’s Military Band used to play Tuesday and Thursday nights in the bandstand that once stood in front of the Tazewell County Courthouse. Other community bands from that era included the Roehrs & Dietrich Union Band, the Pekin Opera House Band, Peobel’s Band, and the Hal Jones Band. All of those bands consolidated to form the old Pekin Municipal Band in 1925 “as a result of Illinois legislation allowing municipal bands to levy a tax for concerts.” The Pekin Municipal Band in turn is the predecessor of the Pekin Park Concert Band. The Nov. 2017 issue of the Tazewell County Genealogical & Historical Society Monthly is devoted to local veterans, and features reproductions of portraits of the 24 members of Gehrig’s Band that were taken on or around Jan. 1, 1902, including a portrait of the band’s director and manager, Charles F. Gehrig, who also played the cornet in the band.